Can you guarantee that I will see some Northern Lights during my stay? Can i Fly a Drone in Kakslauttanen? Can we pick mushrooms and berries at Kakslauttanen? How can I experience a sauna? How do I get to Kakslauttanen? How much daylight there is? What about mobile phones and WiFi connection? What is kaamos or polar night? What is ruska or autumn foliage? 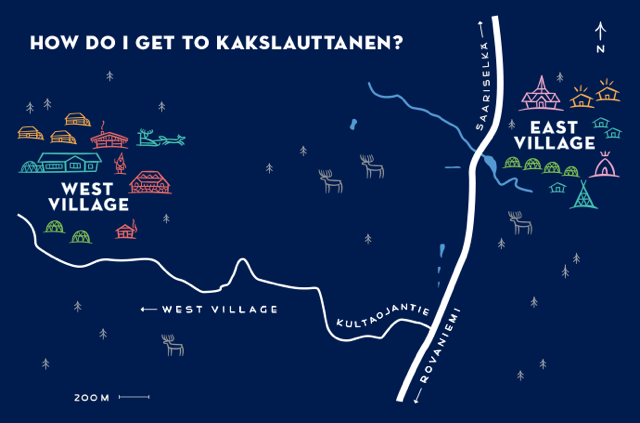 What is the best time to visit Lapland and Kakslauttanen? What is the weather in Lapland like? What kind of clothes should I use while sleeping in the snow igloo? What kind of clothes should I wear in Lapland? Who are the Sami people? Although Kakslauttanen is located in the wilderness, it still benefits from excellent air and land transport connections. You can combine your stay in Kakslauttanen with a city break in Finland’s capital, Helsinki, as all flights to Lapland depart from Helsinki-Vantaa Airport (HEL). The closest airport to Kakslauttanen is Ivalo (IVL), which is just a 30-minute shuttle bus ride away. You can book your airport transfer at the same time as booking your stay. Ivalo is currently served by Finnair (from Helsinki all-year-round and London starting autumn 2017), Lufthansa (from Frankfurt) and Norwegian (from Helsinki). Schedules vary depending on the season. If you are touring around Lapland or flying to other airports in the region you can always take a bus to Kakslauttanen. Buses to and from Rovaniemi all stop at Kakslauttanen, and the journey takes about three hours. Tickets can be bought from the driver. For timetables, visit the website of Matkahuolto, a Finnish company that organizes bus trips nationwide. If you’re arriving by car, just type our address (Kiilopääntie 9, 99830 Saariselkä) into your GPS navigator and you’ll find us easily. We offer free parking, and Lapland has excellent roads. Read more about getting to Lapland on the official Lapland tourist site, OnlyInLapland.com.